Bob-A-Loop’s packaging promoted various tricks that could be performed with the toy. 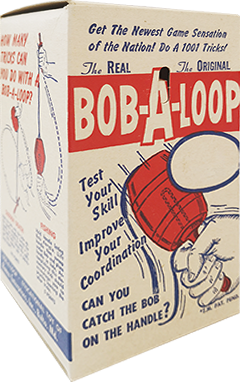 Dubbed “America’s newest game sensation” when it was released in the U.S.A. in 1958, the Bob-A-Loop was a short-lived fad. 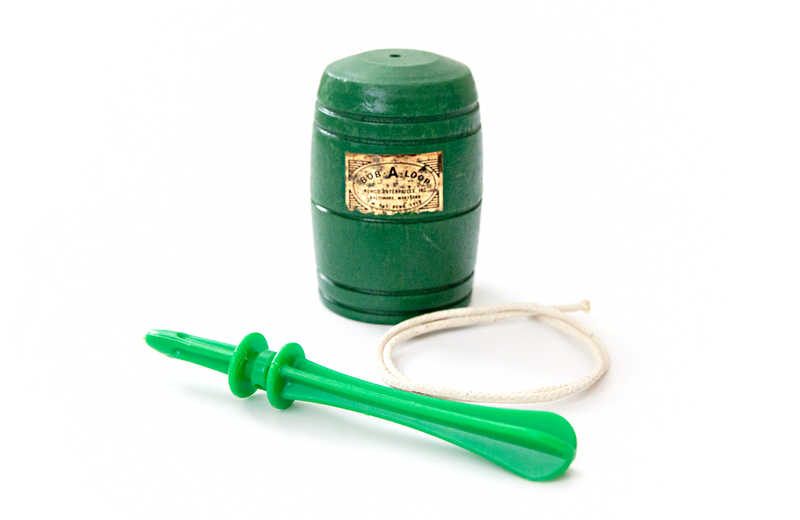 Released by Baltimore, Maryland-based Romco Enterprises, the hand-held skill toy consisted of a miniature barrel tied to a short handle with a 14-inch-long cord. Romco sold two versions of the Bob-A-Loop. The standard all-wood version was initially sold for $0.98, while a hybrid wood/plastic model, the Bob-A-Loop Jr., was sold at for $0.59. Bob-a-Looping required users to yank the barrel and attempt to catch it on the end of the handle. The product’s packaging promoted various tricks of coordination and timing that could be practiced and performed with the toy. These feats of skill were advertised as part of a much larger 1,001 trick bank that Bob-a-Loopers could draw upon to dazzle onlookers. Each trick had a name like “Orbit,” “Fishing,” and “Ring”, and was assigned a point value. Tricks of a higher degree of difficulty paid off in a greater number of points. The first player to perform enough tricks successfully to reach 500 points was declared the Bob-A-Loop champ. The toy was widely advertised on television, appearing regularly on Romper Room and The Buddy Deane Show. Contests were also held in various towns, encouraging friendly competition among fellow Bob-a-Loopers.